2: Target creature gains +1/+1 as long as Tawnos's Weaponry remains tapped. You may choose not to untap Tawnos's Weaponry during untap phase. You may choose not to untap Tawnos's Weaponry during your untap step. 2, T Target creature gets +1/+1 as long as Tawnos's Weaponry remains tapped. 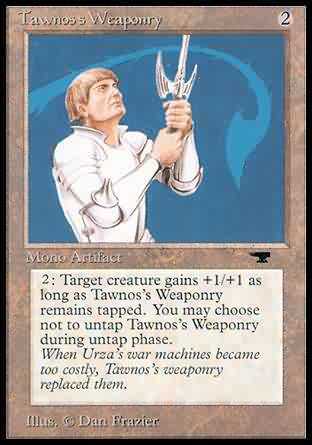 When Urza's war machines became too costly, Tawnos's weaponry replaced them.